Accidents can occur at any time in the workplace. 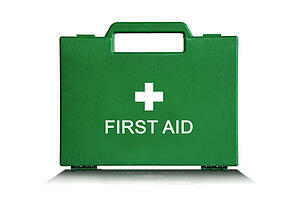 It is crucial to have a reliable First Aid Kit ready and available for when accidents do happen. While OSHA does not specifically define what is considered adequate the agency does state that the supplies found in the kit should reflect the kind of injuries that occur and that the kit should be stored in an area where it is readily available for emergency access. The consensus standard regarding the minimum contents of a first aid kit for the workplace is described in American National Standards Institute ANSI Z308.1 – 2003, Minimum Requirements for Workplace First Aid Kits. By assessing the specific needs of their workplaces, employers can ensure the availability of adequate first aid supplies. A great starting point for employers to ensure their company kits are adequate is to assess workplace hazards that employees are exposed to. A walk-through assessment as well as OSHA 300 Logs and 301 Incident Reports, workers’ compensation injury reports, and first aid logs are all helpful resources to identify any unique problems that necessitate other types of supplies. A company may want to consult with the local fire department, rescue service, medical professionals, or other local emergency facilities for advice on adequate or unusual first aid supplies specific for your company. When a large operation or multiple operations are conducted at the same location, employers will need to determine if there is a need for additional first aid kits, specific types of first aid equipment and supplies as well as specific quantities of supplies and equipment in the kits. Through a hazard assessment employers can ensure that reasonably anticipated supplies are available to treat most injuries and illnesses that could be expected to occur in the workplace. Employers should periodically reassess the demand for the supplies found in company first aid kits and make a conscious effort to adjust their First Aid Kit inventory accordingly.